Be a Guru with these 50 New Sessions. On Sale Now! Calling all guitar lovers! Get your Guru on this month by taking advantage of our annual sale! 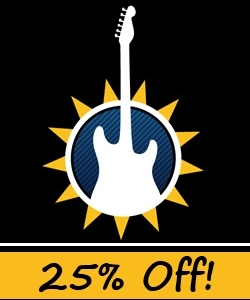 All Guitar Guru Sessions are now priced at twenty-five percent off. Sale ends at midnight on January 31st. The prices for Guitar Guru Sessions typically range from $6.95 through $9.95, and depend upon the length of the Session. At twenty-five percent off, you can pick up your favorite Sessions priced between $5.21 and $7.46. About Guitar Guru: Guitar Guru provides interactive song sessions designed to help teach you how to play your favorite songs on guitar. 2009 was an awesome year for Guitar Guru, because we were able to fulfill a number of your requests. We’ve added new interactive guitar lessons for several songs performed by your favorite artists including: Dave Mathews, Guns n’ Roses, John Mayer, Metallica and several others. 24 Funkytown by Lipps, Inc.